The Blues have already had Two bids rejected by Swansea for the services of Sigurdsson. Here’s why we think we have to continue until we get our man. Swansea are holding firm on the pricetag they’ve placed on Gylfi Sigurdsson of £50million. Everton have so far offered £40mil and, as recently as yesterday, £45mil both of which bids have been rejected. Evertonians may feel that Sigurdsson is probably only worth £30mil-£40mil and they’d probably be right to think that. However, as we seen first hand with John Stones, if a club really want a player and believe he’ll add to their current squad they’ll pay the asking price. It’s pretty evident that Ronald Koeman rates the Icelandic international very highly. 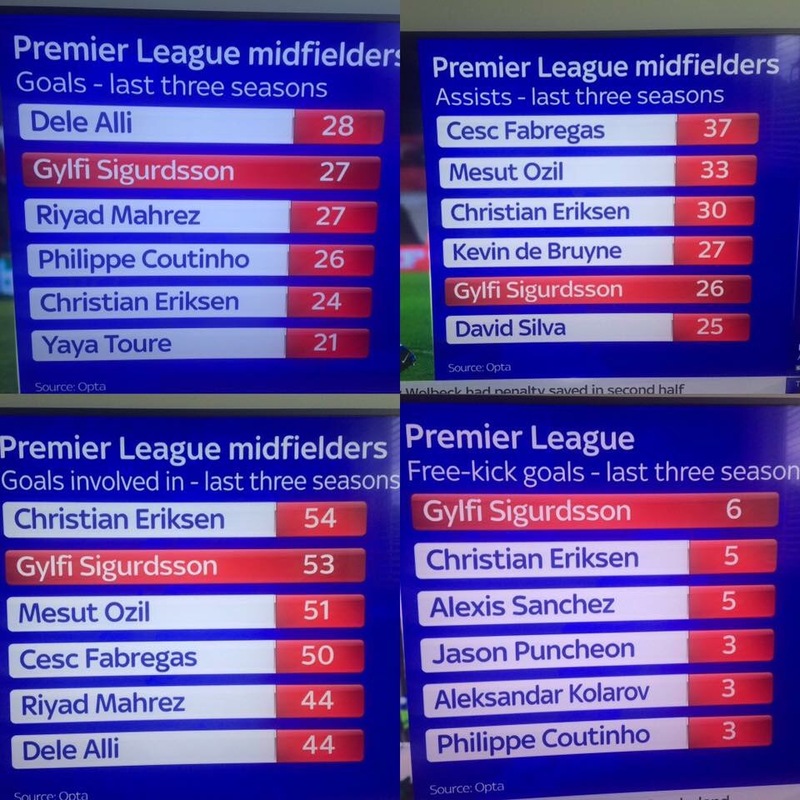 Gylfi Sigurdsson is widely recognised as one of the best dead ball specialists in the Premier league. His range of passing is desired by most midfielders and his game awareness and management has be influential to Swansea remaining in the Premier League. As you can see in the above photo, all but maybe one of those players are now worth in the region of £40mil to £50mil, in fact you might be hard pushed to get any of them cheaper. 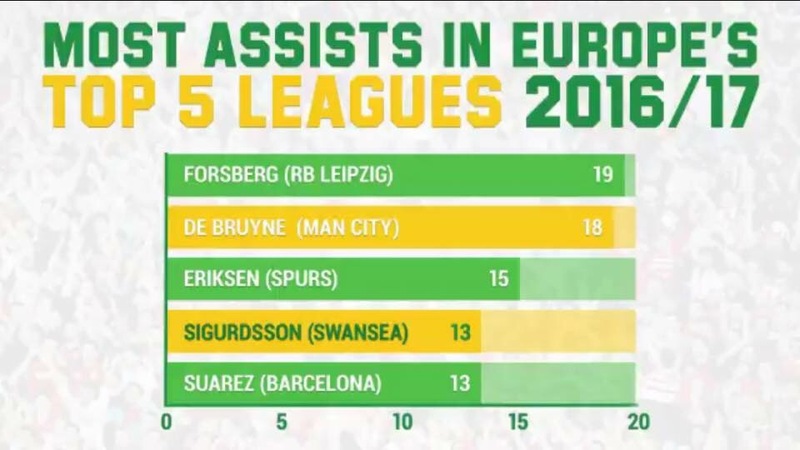 It’s also evident that whilst the media have continuously harped on about the Ozil’s, the Alli’s and De Bruyne’s of the Premier League, Sigurdsson has gone massively under their ‘top 4’ radar. Sigurdsson’s stats have surpassed even the best in the league, putting him firmly in that particular bracket. His value to Swansea is unquestionable and although we as a club have been in that heartaching position of losing your best player to money you can’t turn down, it’s not a factor that should now start to get in our way. Afterall, City didn’t stop their persuit of Stones because they felt sorry for us after Mourinho acted the maggot. It’s business, we’ve been on the receiving to often for to long, we’ve got the pulling power and should most definitely use it. It may well be a reasonable concern that the signing of Sigurdsson, could spell the end of Ross Barkley’s time at Goodison Park. It is of course, something may Evertonians never want to happen to a fellow Blue, but in this instance Ross has had ample opportunities both on and off the pitch. Without knowing to much of the situation regarding Barkley’s apparent refusal of Everton’s contract offers, the player and his playing ability alone may well have been the reason Ronald Koeman has searched for his replacement. Swansea aren’t being cheeky or ridiculous in demanding £50mil, that figure is becoming more and more commonly used by clubs desperate to keep a key player, it’s pretty understandable. But, don’t think for one minute that if we met that asking price they would ask for more. It’s £50million and thats that.